1.1 These connectors were designed for installations in wet or damp locations, and are re-enterable. The connector can be installed underground, in a valve box, in concrete or direct buried in earth. It can also be continually submerged in water to a maximum depth of 6 feet. The Re-enterable connector can be used in conjunction with Decoders or Lightning Arresters or Decoder Cable Fuse Devices, or multiple wire connections. Simplifies the connecting and disconnecting of ground plates and ground rods when testing earth ground resistance. The Lug is made from 6061-T6 aluminum alloy, providing premium electrical and mechanical performance. It can accommodate copper or aluminum wires from 14AWG to 2/0AWG. The 3/16” Hex Set-screw is radially tipped to reduce conductor strand damage when the Setscrew is tightened. The Lug is encapsulated in EPDM rubber to withstand the rigors of the application environments. The Connector main body, the Set-screw Access Plugs and the Connector Sleeves are radially ribbed to ensure a waterproof connection. UL Listed under UL486D for use in the USA and Canada for up to 600V. 270RC2 2 1-7/8" 2-5/8" 2-1/8"
Connectors are available in 3-packs. There are 30 of the 3-packs per case. The weight is 1.45 pounds per 3-pack. 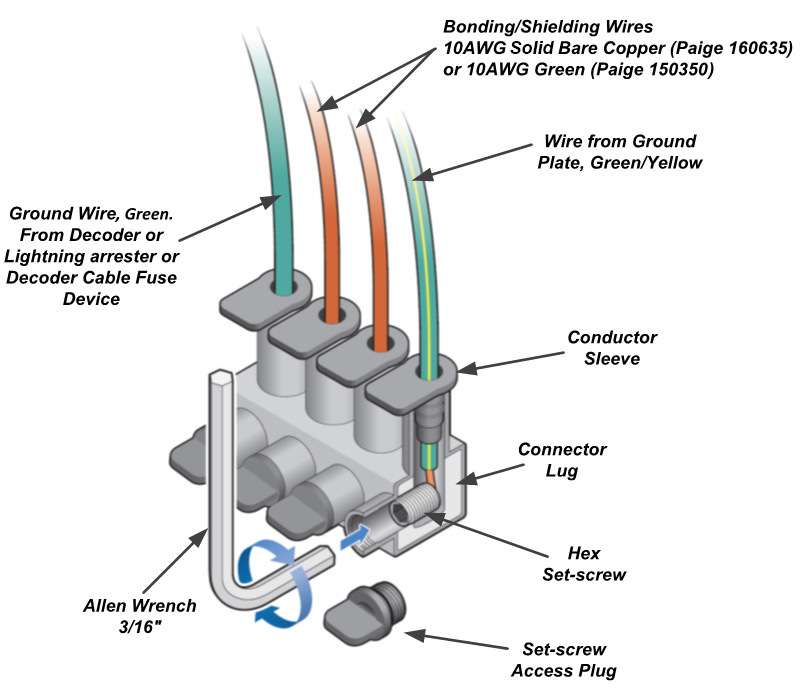 The Paige Electric Re-enterable Connector shall be installed at all: Ground Grids, Decoder Cable Fuse Devices, Grounded Decoders, or any other grounded device. This will facilitate the testing of the earth ground resistance in decoder systems where the ground grid must be disconnected before taking its resistance reading. Paige Electric 270RCX Series. No alternates. * The connector body and Connector Sleeve and Set-screw Access Plug must be inspected to make sure they have not been damaged before the connector is reused. All connector components and the wires must be clean before re-assembly.